A beautifully arranged holiday dinner table is a feast for the senses. Occasionally, however, festive fare that looks perfectly delectable can sicken unsuspecting diners. There are many ways in which the “perfect” holiday dinner can go horribly wrong. Fortunately, most foodborne illness can be avoided when cooks maintain and apply a keen awareness of the basics of food safety. 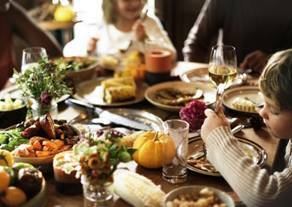 Add to that a new “app” issued by the US Department of Agriculture (USDA), and safe food storage and preparation can be a snap this holiday season. “Clean” starts with the cooks washing their hands with soap and warm water before and after handling any food item (not just raw animal or vegetable products). Food preparation surfaces, such as cutting boards and countertops, should be thoroughly washed with soap and hot water, followed by sanitizing with a solution of one tablespoon of unscented, liquid chlorine bleach per gallon of water. Air-dry. “Separate” foods so that juices from raw meats, poultry and seafood, which can contain harmful bacteria, do not contact ready-to-eat food. Place raw meats, poultry and seafood in plastic bags in the refrigerator to prevent their juices from dripping onto other food. To lower the risk of accidental dripping, place those plastic bags on the lowest shelves of the refrigerator. Designate one cutting board for raw fruits and vegetables and another for raw meats, poultry and seafood. Never place cooked food back on the same plate that previously held raw food unless the plate has first been washed in hot, soapy water. “Cook” foods to safe minimum internal temperatures to destroy harmful bacteria. The food thermometer should be placed in the thickest part of the food, away from bone, fat or gristle. According to the Foodsafety.gov website, poultry, including chicken, turkey, duck and goose, should be cooked to a minimum internal temperature of 165 degrees F.
“Chill“ foods that should be refrigerated at 40 degrees F or below. Defrost frozen foods in the refrigerator, microwave or cold water. Do not leave food at room temperature for more than 2 hours (or 1 hour when the air temperature is 90 degrees F or more). Meat defrosted in the refrigerator is safe to re-freeze before or after cooking. Foods defrosted in the microwave or cold water must be cooked before freezing. Store eggs in the refrigerator in their original carton and use within three to five weeks. The new “Foodkeeper” app, developed by the USDA’s Food Safety and Inspection Service, with Cornell University and the Food Marketing Institute, was designed to help consumers understand and optimize food and beverage storage. The app is available for Android and Apple devices. Cooked poultry dishes (e.g., turkey and chicken) last 3 to 4 days when stored in the refrigerator and 4 to 6 months if stored frozen. Poultry should be cooked in an oven to a safe minimum temperature of 165 degrees F.
Bagged greens, such as spinach and lettuce, last 3 to 5 days after the date on the bag when stored in the refrigerator, and 2 days if refrigerated after opening. Freezing bagged greens is not recommended. Hard cheeses such as cheddar, Swiss and block parmesan last 6 months in the refrigerator before opening, and 3 to 4 weeks in the refrigerator after opening, but 6 months if stored frozen. Ready to Bake Pie Crust should be used by the date indicated on the package when stored in the refrigerator, but can last up to 2 months if stored in the freezer. Whipped, sweetened cream lasts 1 day when stored in the refrigerator and 1 to 2 months if stored frozen. Fruit juice and punch in cartons last 3 weeks in the pantry, 7 to 12 days in the pantry if stored after opening, and 8 to 12 days if refrigerated after opening. Here’s wishing you a happy and safe Holiday Season! Linda F. Golodner is President Emeritus of the National Consumers League and Vice Chair of the Water Quality and Health Council. 1 The recommendation not to refrigerate potatoes comes from the United States Potato Board.